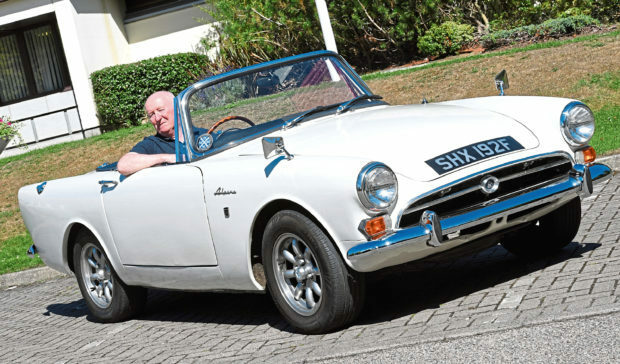 Ron Moir and his Sunbeam Alpine. Picture by Kami Thomson. The Wolverhampton-based manufacturer produced its first car in 1899, seemingly offering a winning formula when it came to filling the trophy cabinet. Yet despite success in Grand Prix races, breaking the 1922 Land Speed Record and even taking a starring role as the very first 007 Bond car in Dr No, Sunbeam remains one of the more overlooked British sports car producers. Ron Moir, however, is well aware of the brand’s merits, and can often be seen negotiating the Aberdeen rush-hour traffic at the wheel of a white 1968 Sunbeam Alpine Series V.
“I originally saw it advertised in the Evening Express motoring classifieds,” said the 72-year old. “It was about 1996 and was being sold up in Dufftown. “I went up to take a look at it and ended up putting in a bid. “But it was weeks and weeks before the owner got back to me and to be honest, I’d sort of forgotten about the whole thing. “But then I got a call saying that I’d been successful and that if I wanted the car I’d need to pick it up on Friday. The restoration was a real ground-up project for Ron, who spent every evening over the next 20 months under the bonnet of the Alpine. As a trained mechanic, he was able to complete most of the work himself, but even so, it was a big job to take on. 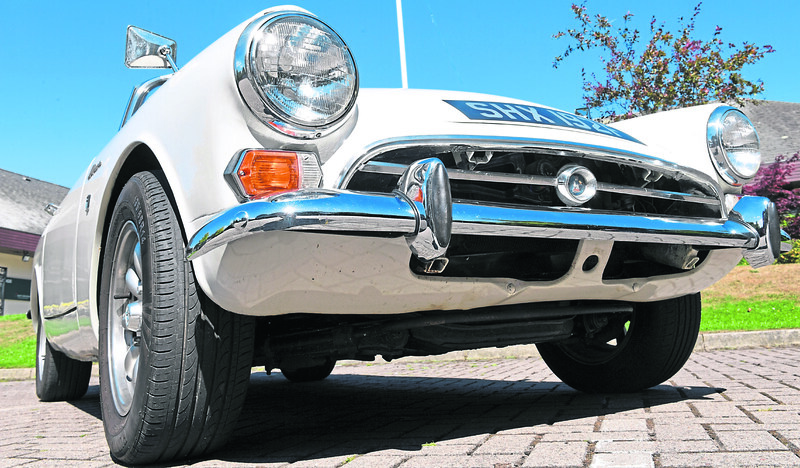 “It had been stored in a damp garage for 16 years before I got it,” Ron said. “It was a lot of work to get it back roadworthy and I did most of it myself with some help from a friend for the bodywork. “Then it was a case of painting it and going through the paperwork to get it on the road. “Once it was all ready to go, I gave it to my son as a 21st birthday present. 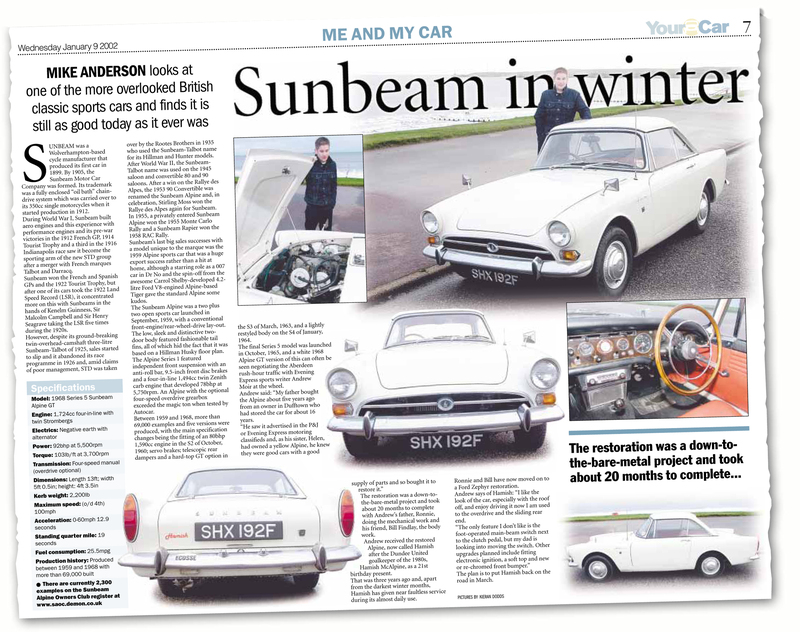 Sure enough, Ron’s son Andrew enjoyed being behind the wheel of the classic motor, even appearing in the Press & Journal motoring supplement with it 16 years ago (see right). But as his career took off and saw him relocate to Dubai, it fell to Ron to take care of the Alpine once again – a job he has enjoyed over the last few years. “Andrew named him Hamish, so it’s a he not a she,” Ron said. “And Hamish was named after the 1980s Dundee United goalkeeper Hamish McAlpine. “Andrew was a sports reporter you see, so it was his two passions combined – sports and cars. “He moved abroad about eight years ago but I’m still just the custodian of Hamish. In the 22 years Hamish has been in the Moir family he has given a near faultless service despite his advancing years. Ron takes him out to various rallies and events throughout the year, and is also passionate about keeping classic cars in near daily use. “I was at the doctors and hairdressers with him this morning,” said Ron. “I think there is certainly something to be said for using classic cars as often as you can to keep things all ticking over properly. “Hamish is a really nice car to drive too, it’s got an overdrive which gives it a more relaxed engine. “I’m really looking forward to the August Amble rally later this month in particular. “We all meet at Fettercairn and set off on a 120-mile run over roads that you wouldn’t normally be taken on. “They are very quiet and take you through some great scenery. “I couldn’t imagine doing these rallies in any other car. “Hamish has been in the family for 22 years now and he’s not going anywhere.